Gearbugs Corp. just announced that they are raising funds via Kickstarter to finish the development and production of Armz, a smart toy that can be customized to play various types of game modes. The company set out to raise $10,000 on Kickstarter to finish development and produce the first batch of their latest smart toy invention. Armz is a new, smart toy that is designed to be highly customizable. The heart and soul of Armz is the Smart Core™ which contains the motors and mechanisms that allow it to move, speak, and light up. In addition to the Smart Core™, Armz also comes with five different arm attachments that can transform the core into a personalized toy. Gearbugs Corp has also developed an app that will be available on both the Google Play Store and Apple App Store. By syncing the app to the Armz via bluetooth, players will be able to access multiple game modes that match one of the five attachments. The current lineup of game modes include the following: Remote Control Racing, Steering Wheel Racing, Sumo Wrestling, and Tank Battle. While the gaming feature is one of the main features of Armz, it also meant to be much more than just a simple toy. When Armz is not out on the field for matches, it can be placed on its charging dock to serve as a mood lamp or night light. Users can also customize the voice of Armz with their own recording and program it to act as a virtual home assistant. Finally, a blockchain coding mode is also available to act as an educational tool to teach basic coding. With all of the available features, Armz users are able to put their imagination to the test by referring to the blueprint on the application and creating their own side attachments via 3D printing technology. As users get more accustomed to Armz’s capabilities over time, people may find that there are certain attachments that are not yet available that may enhance the performance of Armz. Armz is now available on Kickstarter with exclusive early bird prices starting at $95 (40% off retail value). After the campaign, Gearbugs Corps. anticipates manufacturing and delivery to be fulfilled by the end of August 2019. Any influencers or journalists interested in receiving a sample and reviewing Armz are encouraged to submit an inquiry through its Kickstarter page. NEW YORK, February 14, 2019 — Today VTech® announces the introduction of Myla the Magical Unicorn™, a colorful robotic unicorn toy that glitters with lights as she talks and sings, while introducing early concepts of color combination in a fun way. Marking VTech’s entry into the robotics toy category and remaining on-trend with the continuing popularity of unicorns, this majestic interactive friend encourages kids to use the magic brush to choose a color from the butterfly palette and magically apply the color to her eyes, wings and horn. 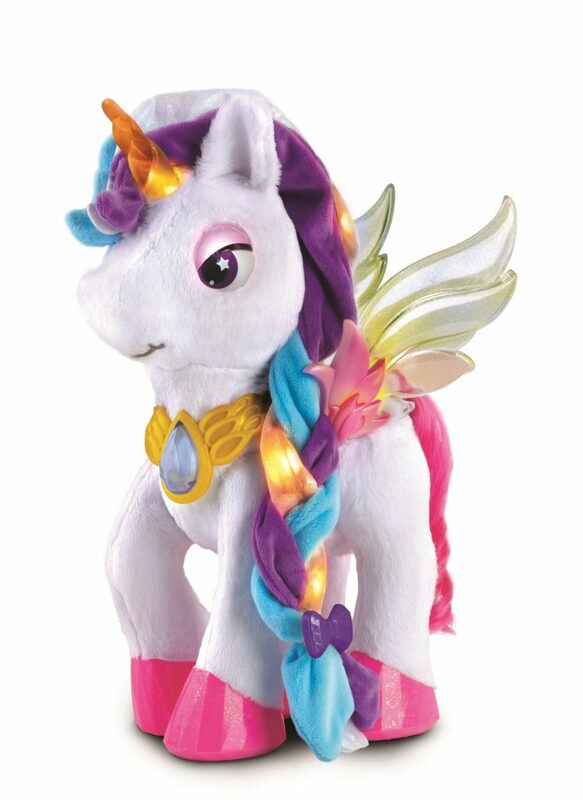 Myla the Magical Unicorn is on display at the 2019 North American International Toy Fair®. To customize Myla, simply touch her magic brush to the butterfly palette to choose a color. Then touch the magic brush to her eyes, wings and horn to decorate Myla in a variety of colors and even practice color combinations. Kids can also braid Myla’s mane, brush her tail and complete her look by adding her crown and hair clips. For interactive fun, kids can sing a rocking duet with Myla and her microphone. When it’s time to go solo, pull the microphone away and Myla will stop singing but continue to play music. VTech is a world leader in age-appropriate and developmental stage-based electronic learning products for children. As a pioneer in the learning toy category, VTech develops high-quality, innovative educational products that enrich children’s development and make learning fun. With a rich 40 year history, VTech has not only established itself as a learning authority but also consistently remains at the forefront of innovation with multiple award-winning products, including prestigious Toy of the Year (TOTY) Award winners. The company also has a broad range of award-winning infant, toddler and preschool products available in 31 different languages worldwide, with more than 100 new products introduced every year. In order to further strengthen VTech’s position as a learning authority, new products are developed with critical insights from a dedicated team of in-house learning experts. Wheeling, Illinois (February 14, 2019) – Elenco, the maker of the award-winning Snap Circuits® products, announces a new line of educational toys under the brand name TEACH TECH™, with a focus on hands-on, building fun. The first offerings within the TEACH TECH™ line feature robotic kits, including products that explore renewable energy and coding. Following the Learn by doing® philosophy found in all Elenco products, TEACH TECH™ enhances play quality with an emphasis on Do-It-Yourself building to boost confidence and critical thinking skills. 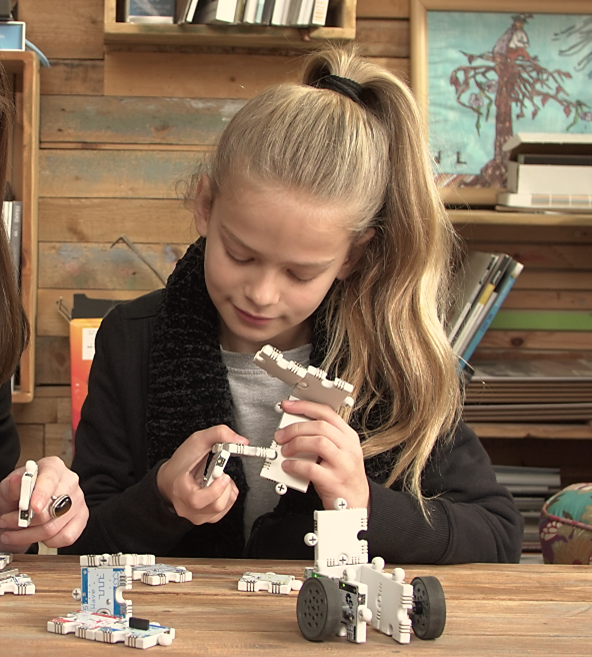 Products within this line will appeal to all who enjoy using their hands to build and tinker and then bring their creations to life with movement, coding and programming. Future-minded kids can also investigate alternative power sources with kits that highlight solar, hydraulic, wind, or air power. Tobbie II Kids can build a robot, then code and program with MakeCode or Phython Editor. With 6 legs and a fully-rotational body, Tobbie includes motor, infrared sensors, buzzers, and BBC Micro:bit. Bluetooth-controlled and user-friendly. DIY and Coding in one kit! Elenco will officially introduce the TEACH TECH™ brand and unveil Tobbie II and Mech-5 at this year’s New York Toy Fair, with demonstrations of TEACH TECH’s green energy and other mechanical-robotic kits within the line. TEACH TECH™ will be available in all Elenco’s retail channels, including specialty stores, larger retailers, and online retailers. The official product launches for Tobbie II and Mech-5 are slated for Summer 2019. Green Energy! In line with the focus on renewable energy evident in the Teach Tech™ line, Elenco also introduces Snap Circuits® GREEN ENERGY – a reboot of the popular Snap Circuits® GREEN – updated with new parts and content for today’s exploration into alternative energy concepts, including electric cars, windmills, and hand-generated power. Perfect for environmentalists and future engineers! Toy Of The Year! SNAP CIRCUITS® BRIC: Structures, released in 2018, is a Toy Of The Year Finalist! BRIC combines SNAP CIRCUITS® with ordinary building bricks to make endless combinations of construction and circuitry. Winner of KAPi BEST EDUCATIONAL PRODUCT award at the Consumer Electronics Show, ASTRA Best Toys For Kids, and the inaugural recipient of the Seriously STEM award. STEM-Approved! Elenco is proud to announce that their award-winning SNAP CIRCUITS® line of educational products and toys has earned the STEM APPROVED Trustmark from STEM.org. In addition, Elenco has partnered with STEM.org for the upcoming SNAP CIRCUITS® GREEN ENERGY kit. STEM.org’s mission is to make quality STEM (science, technology, engineering, and mathematics) education accessible to all. For more than 15 years, STEM.org has been at the forefront of the global, Pre-K – 12th grade STEM education movement. About Elenco: Family owned and operated for over 45 years, Elenco has provided educational/STEM products, along with hobby and test equipment to consumers and schools. Elenco’s award-winning SNAP CIRCUITS® products teach kids to have fun learning electricity, engineering, circuitry and more. The award-winning SNAP CIRCUITS® brand has been endorsed by educators globally and used in schools, libraries, museums, after-school and homeschool programs, STEM and Maker programs, and at home. Elenco WEmake™ line includes educational, D.I.Y kits and tools that teach soldering and other basic electronics concepts and skills. Elenco is also the North American partner for world-renowned toy brands including Engino Construction and Edu-Toys Science Kits, and more. Broadly distributed through a wide-range of retail channels, Elenco products can be found wherever fun, innovative, science-based activities are sold. Our Mission: Our mission is to provide quality, innovative toys and educational products that are fun, affordable, engaging, and designed to instill a passion for learning and creating. We’re committed to inspiring imagination, invention, and exploration. We believe the best way to learn is by doing. (New York) February 15, 2019 – POWERUP Toys (Toy Fair Booth #2789), the creator of the first smartphone-controlled paper airplane motor kit, is introducing three new products at Toy Fair 2019 – POWERUP 4.0, POWERUP RACERS, and OKO Multi View. To see these products in action, visit POWERUP Toys at Toy Fair 2019 in booth #2789. To see the full line of POWERUP Toys motors and accessories, visit: www.poweruptoys.com. VERNON HILLS, Ill., Feb. 16, 2019 /PRNewswire/ — Throughout its 35-year history, Learning Resources® has dedicated itself to developing toys on the forefront of what children need to learn and how they are best inclined to learn it — through play. Now, its efforts to provide the earliest possible screen-free coding experiences to kids have earned the educational toy company its first ever Toy of the Year (TOTY) Award. The award for Innovative Toy of the Year was given last night to Botley™ the Coding Robot at the annual awards gala presented by the Toy Association. Botley engages children and sparks curiosity about coding in a fun, friendly, hands-on way, all without the use of a screen. In 2018, Botley helped define a new category of screen-free coding toys. Last night’s TOTY tops a list of more than 13 accolades and awards for the screen-free coding robot including „Best of CES“ by Reuters and „Best Toy of the Year 2018“ by Parents magazine. Children as young as five can learn to code with Botley, detecting objects, programming if/then logic, following looping commands and taking on obstacle courses. With other category finalists including Harry Potter™ Wizard Training™ from JAKKS Pacific, the K’NEX Thrill Rides Bionic Blast™ Roller Coaster Building Set, Wow! Stuff’s Mystery Flying Snitch and Thames & Kosmos’s Sensors Alive: Bring Physics to Life!, the coveted industry nod was given specifically to the 77-piece Botley the Coding Robot Activity Set, which allows kids to start coding with Botley right out of the box in addition to building obstacle courses, mazes and more. Following Botley’s success, Learning Resources‘ new Coding Critters, already the winner of Parents magazine’s 2019 „Best of CES“ award, continues the company’s mission of introducing screen-free coding, now to preschoolers as young as four, through storybook coding adventures with adorable interactive pets. Both products will be on display at the 2019 New York International Toy Fair through February 19 in the Learning Resources Booth (#403). Also be sure to check out Learning Resources‘ Director of Product Development, Tom Runtz, on the STEM/STEAM Toy Panel with other leading industry experts Sunday, February 17 in Level 1, Hall 1E, room 1E09. Learn more at www.LearningResources.com. Get social with @LearningResources on Facebook and Instagram and on Twitter @LearningsHandsOn. #CODING #STEM. We’re the toy cash registers that help kids learn to count. We’re the alphabet puzzle blocks that inspire a love of reading. We’re the coding mouse that schools use to prepare students for tomorrow. We are Learning Resources®—and our mission is to help kids love to learn. For over 30 years we’ve been the leader in educational toys, with more than 1,000 items sold in over 80 countries. Our toys are designed to help children build educational skills… and get ready to take on the world. For more information, visit www.learningresources.com, or follow the brand on Twitter @LearningHandsOn, Facebook @LearningResources and Instagram @learningresources. 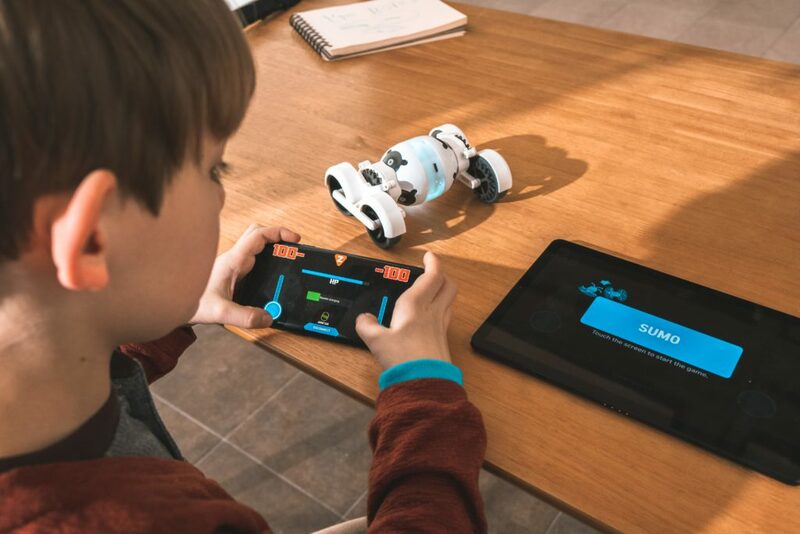 BOULDER, Colo., February 19, 2019 ‒ Sphero, the industry leader in robotics fused with STEAM learning, announced today its Kickstarter launch of RVR – a ready-to-drive, fully programmable and customizable robot with endless coding possibilities. The campaign begins today on Kickstarter with pledge levels starting at $199 (MSRP for $249) and initial shipments will be available starting in September 2019. Backers who support the RVR project within the first week of launch will be eligible to be selected for an all-expenses paid trip to Sphero HQ in Boulder, CO to compete in an all-day RVR Hackathon on March 14, 2019. RVR is drivable right out of the box, making it approachable and accessible to coders of all levels, including beginners. In addition, its advanced features are geared specifically for those looking for a more complex coding experience — the first of Sphero’s products to do so. For advanced coders, RVR can be fully customized through a universal expansion port, full suite of on-board sensors and an advanced control system. RVR is fast, exceptionally nimble and fun to drive for coders of all abilities. It sports a fine-tuned, high- resolution motor encoder, allowing it to be driven with extreme agility, accuracy and torque that can easily scale a 45-degree angle. 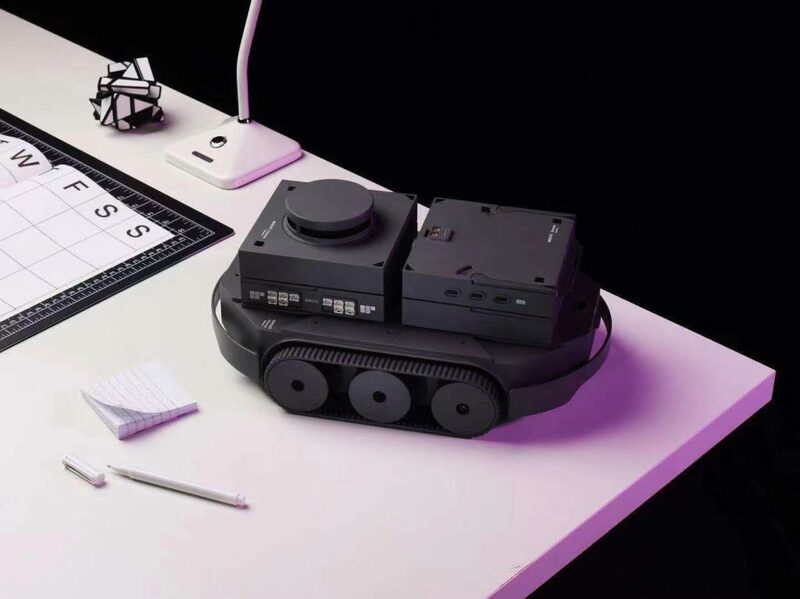 Beyond its out-of-the-box base, RVR’s universal expansion port has the ability to connect to third-party hardware like Raspberry Pi, Micro:Bit or Arduino, allowing users to customize the robot however they want. The robot is outfitted with several onboard sensors that will get any maker’s imagination going: a color sensor, light sensor, IR, magnetometer, accelerometer and gyroscope, as well as a roll cage and clear protective plate that are removable. RVR’s ambient light, color and 9-axis IMU are able to send and receive signals to interact with other Sphero robots. The large battery inside RVR is removable, making charging easier and faster. 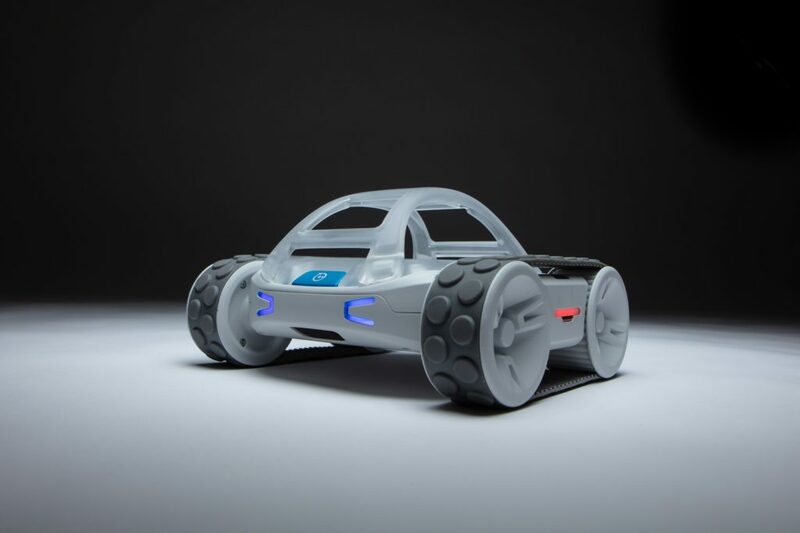 To support customization with the expansion port, Sphero is partnering with SparkFun Electronics to build kits that inspire users to take the RVR to the next level – from adding camera vision and GPS to building a complete autonomous vehicle. SparkFun is also backing the KickStarter through the „Get a Bot, Give a Bot“ initiative, where they will match the first 50 RVR’s purchased with a donation of 50 RVRs to schools. With RVR, like all of Sphero’s products, users have access to the Sphero EDU app, which connects a vibrant, active community of DIYers, makers, programmers, hackers and educators to share tips, questions and commentary. This unique community enhances the product experience, providing users with resources to take on new challenges, solve problems, be creative and share creations. Sphero will roll out an initial wave of RVR content on the app in conjunction with its launch. To learn more about RVR, visit http://sphero.com/RVR or the Kickstarter project site. Follow Sphero on Facebook, Instagram or Twitter. ABOUT SPHERO: Founded in 2010 and based in Boulder, CO, Sphero’s ongoing mission is to inspire the creators of tomorrow. We’re available in 80+ countries around the globe and have sold more than four million robots to date… and counting. Touted as “the best day of school” for kids, we aim to be all that and more as we continue to explore new technologies in the realm of creative play. We firmly believe that play is a powerful teacher, and as long as we’re sparking imaginations around the world, we’ll keep fueling that fire. are approachable for all skill levels, allowing us to reach as many minds as possible. To date, the Sphero Edu team works with more than 30,000 educators, in more than 20,000 schools across the globe. More than 1.3 million students have been positively impacted through Sphero Edu and its work to educate kids surrounding technology and computer science. For more information, visit sphero.com/education or follow @SpheroEdu on Twitter. challenging than building mobile applications. support other developers in their robotic builds. than ever to develop software applications for your robot. Speaker & Microphone Array, and Rover Base (four wheeled module). video processing, and reinforcement learning. led by GGV Capital and participated by Zhenfund. Wenn Wundersames aus 3D-Druckern kommt und das Jahrhundert von gestern in die Welt von morgen einlädt, ist wieder Maker Faire Ruhr. Phantastisches, Verrücktes und Digitales sind die Zutaten für ein Festival der Extra-Klasse. Die DASA Arbeitswelt Ausstellung präsentiert am 23. und 24. März in ihren dafür wie gemachten Hallen, was Zeitgenossen in der Garage, im Hobbyraum oder im Wohnzimmer alles zustande bringen. Das weltbekannte Tüftel-Festival hat das Ruhrgebiet mittlerweile fest im Griff. Ob aus Bochum, Essen oder Schwerte – die Region ist ein Tummelplatz für schräge Ideen. DIY-Blog- ger, Experten für optische Täuschungen, Amateurfunker oder OpenSource Programmierer: Der Rohstoff nach Ende des Bergbaus sind reichlich findige Ideen. Wer mag, trifft auf eine Steampunk-Spezialistin aus Witten, auf das neue FabLab aus Hamm oder auf Größen der Szene wie Upcycling-Spezi Thomas Zigan von Tanz auf Ruinen oder die Dortmunder Platzhir- sche „Urbanisten“. Neben jeder Menge Lokalcolorit gibt es beliebte und bekannte Attraktionen wie die nieder- ländischen Maschinen-Umbauer „Abacus Theater“ mit Gefährten, die jedes Foto bereichern, den Fotobus „Cliff McLaine“ für ein Erste-Sahne-Selfie oder den Dampfzirkus Papenburg mit Fahrzeugen, die bei der Vampirjagd hilfreich sein können. Nicht fehlen dürfen weder zeitrei- sende Beamte noch Maskottchen Makey. Zum 500. Todestag von Universalgelehrten Leonardo da Vinci hat sich Zirkus Meer eine besondere Würdigung ausgedacht und überrascht die DASA-Gäste mit einer neuen Knobe- lei aus dem Dunstkreis des Genies. Erstmalig am Start sind außerdem die „Maker Girls“ aus Königswinter, die für noch mehr Frauenpower sorgen. Und WDR5-Küchenexperimenteur Sascha Ott sorgt mit verblüffenden Versuchen für jede Menge Action. Insgesamt laden über 60 Stände zu einer bunten Rund-Tour zwischen IT und Design sowie Produktideen aus Hightech, Kunst und Handwerk ein. Workshops und Vorträge machen die Maker Faire Ruhr in der DASA zu einem gelungenen Erlebnis für Entdeckungsreisende. Die Maker Faires präsentieren „Do it yourself“ Projekte aus aller Welt. Ziel ist es, die Idee des Selbermachens zu stärken, eigenen Technik ideen freien Lauf zu lassen und offene Au- gen zu haben für eine neue Verwendung von gebrauchten Gegenständen. An beiden Tagen ist die „Maker Faire“ in der DASA von 10 bis 18 Uhr geöffnet. Der Eintritt beträgt 8 Euro, die Familienkarte kostet 16 EUR. Make Munich is Southern Germany’s largest maker and do it yourself festival, which will take place for the fifth time in Munich next March. It has been firmly established in Munich since 2013 and will even be expanded by a second exhibition hall in 2019. On 2nd/3rd March 2019, the makers will present their creative ideas, inventions, projects, technologies and their open, colourful culture of innovation. At the exhibition booths and in many inspiring lectures, the Maker scene will be experienced in its entire variety. But it’s not just about spectating, it’s also about doing it yourself and experimenting: In numerous hands-on workshops „new makers“ are taught all the skills they need to be creative and inventive and to produce their own things using modern technologies. The Munich Maker Festival is a colourful public event for all ages. You can touch and try out high-tech here. The mega topic of digitisation can be experienced by everyone in a comprehensible and creative way. The diverse topics at Make Munich include electronics, Internet of Things (IoT), 3D printing, digital tools, robotics and fashion technology. Maker start-ups show the way to professionalisation. FabLabs and Makerspaces present their ideas and creative communities. Also projects and initiatives from the circular economy, repair culture, bio-hacking and design & craft present themselves to the public. A completely new feature is a separate large area for the „Young Maker“ young talents. Our long-standing partner and main sponsor, Allnet GmbH, will be networking the maker scene with established medium-sized companies from its surroundings in a dedicated area in the new „Kohlenbunker“ hall on the Saturday of the fair. As the new main sponsor, Siemens AG is also on board to promote the maker culture and innovations across society. As a close educational cooperation partner, Munich University of Applied Sciences will present many exciting university maker projects. Other colleges and universities will also present their FabLab initiatives and ideas.